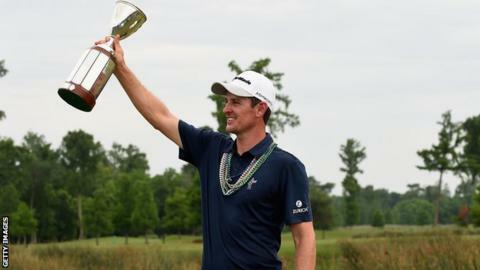 England's Justin Rose birdied the last two holes to win the Zurich Classic of New Orleans on Sunday. It was a seventh PGA Tour title for the 34-year-old, who won by one shot from American Cameron Tringale, 27, with Boo Weekley, 41, a further stroke behind. Rose carded a 66 in a weather-disrupted final round in Louisiana. The world number nine, runner-up at the Masters, posted a 22-under-par total of 266, but had to wait for the last groups to finish before celebrating. Tringale, one of five players to hold at least a share of the lead in the final round, eagled the par-five seventh on the way to a 65.